Mulhollow B & B Bed & Breakfast Achill Island | Achill Island Bed & Breakfast Co Mayo Ireland - Bed & Breakfast Menu. Arise from your bed and enjoy breakfast at Mulhollow. We believe that breakfast is the most important meal of the day and our breakfast menu reflects this. You have a choice of a traditional Full Irish Breakfast with all the trimmings or a lighter breakfast meal such as poached or boiled egg. We also serve a wide choice of fruits, cereals, yogurts, and juices. 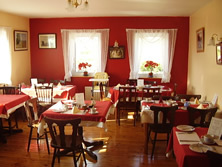 Breakfasts are served between 8.30am and 10.00am in our dining room which can cater for 16 people at a sitting.
" West Coast Breakfast "